This was my first visit to Australia, it was Kathy´s second. She was last here 7 years ago for the hosts, April and Dave´s´wedding. Kathy first met April years and years ago when they both worked for Camp America in their Summer hols, supervising lots of stroppy American rich kids for weeks on end while their parents went yachting around the Bahamas. Or something. The experience made them firm friends, even though they have really only spent a matter of weeks in each other´s company in the time since. April is a travel agent and with her hubby Dave they have seen most of this world. But before meeting April and Dave we had to get past Australian Quarantine. I was scared. The stories I´d heard made it sound more severe than Russian border control. There would be a strip search, chemical showers and all food (especially marmite) and organic materials (anything with seeds or made of wood) confiscated. We had spent our one productive afternoon in Bali scrubbing boots and bags, and picking out seeds and grasses from our stuff with microscopic precision. As it happens, they didn´t seem that bothered. As long as you weren´t hiding a wooden Balinese Buddha you were okay. A quick look over the boots and we were waved on. Those with Buddhas (mostly young men in their 20s sporting new, swollen, painful looking tattoos) were ushered in to a different queue monitored by lady customs officials who had clearly modelled their look on Rosa Klebb. Good luck. Our first full day in Oz was to start with a traditional Aussie BBQ. The venue was friends of A&D called Rod and Kylie. After a mountain of sausages, bacon, eggs, OJ and tea we were all set for enjoying our next Aussie institution, an afternoon at an Aussie Rules Football game. Freemantle Docker (Freo) Vs Saint Kilda Saints (The Saints). Freo play in a lurid bright purple. We skipped the merchandise stand and made do with a beer and a hearty Mrs Mac´s beef pie instead. Lovin´it already! The atmosphere was great. The game lasts about 2.5 hours but it really doesn´t seem that long. The action is fast paced and the point scoring high. A&D kept us right and after about 30mins we had a sure grasp on the rules. Dave filled me in with all the stats and the key players. I learnt who the legend "MAXEE" is and that St. Kilda´s main man goes out with an actress from Neighbours. Cool. I think. Dave is a very tall man at about 6ft 7. All the AFL players are tall, some even taller than Dave. I would feel like Jinky Johnston out there. AFL: not a game for dwarves. At half-time Freo were winning but by the 4th quarter they had suffered a might hammering. To quote Dave, "They were shockin´. That was murda´. Wasn´t it darl?" Even though they lost, I loved the game and I loved being in Dave´s company - a big warm hearted guy with a dry sense of humour. The next day was Kathy´s birthday. April took us to the Wildlife Park. Like 2 big kids we got to wonder about stroking kangaroos, koalas and pose with giant, sleepy-eyed wombats. At lunch-time I fell in love with April. She is the Queen of the picnic. Kathy tells me that she learnt her trade from April. 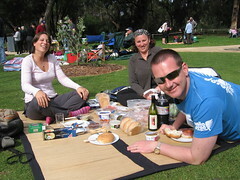 Like the BBQ, Aussie´s have transformed the picnic into an artform of itself. The climate helps. My mum and Kathy´s mum are also Picnic Queens. But so many of many picnics as a boy are remembered from the inside of a car staring at the rainsoaked beach or the sodden picnic tables in the forest carpark. Familiar to you too? For Kathy´s birthday meal we chose Kathy´s all time favourite dining experience- a Seafood Platter at Joe´s Seafood Shack in Freo. WOW! It was amazing. Crayfish, barracuda, scallops, prawns, squid and something green called salad. The shack itself was fitted out something similar to Flint´s wooden cabin in the film Jaws.